Betting on the Chinese Communist Party, and why that could make us poorer. China’s economy is showing signs of failure, but people keep betting on it. For example, last week an index of Chinese manufacturing output showed its fifth consecutive month of falls, and China-linked assets shot up. Financial markets believe the Chinese government will come to the party with extra spending and extra stimulus. The Chinese government obviously wants the economy to keep growing. The continued existence of the Communist Party is tied to the performance of the Chinese economy. They have to keep it ticking over. Their motivation is clear and pure and strong. But motivation is not always enough. Can we distinguish warnings signs from red flags? Consider this. The only reason markets need to trust the Chinese government to add more stimulus is that previous rounds of stimulus haven’t done enough. Financial markets are betting the guys that got the market into this pickle can safely navigate out again. “We expect Beijing to launch a series of policy measures to stabilize growth. Likely options include lowering entry barriers for private investment, targeted spending on subways, air-cleaning and public housing, and guiding lending rates lower,” said Hongbin Qu, chief China economist at HSBC. A few iterations is enough for the human brain to learn a pattern. 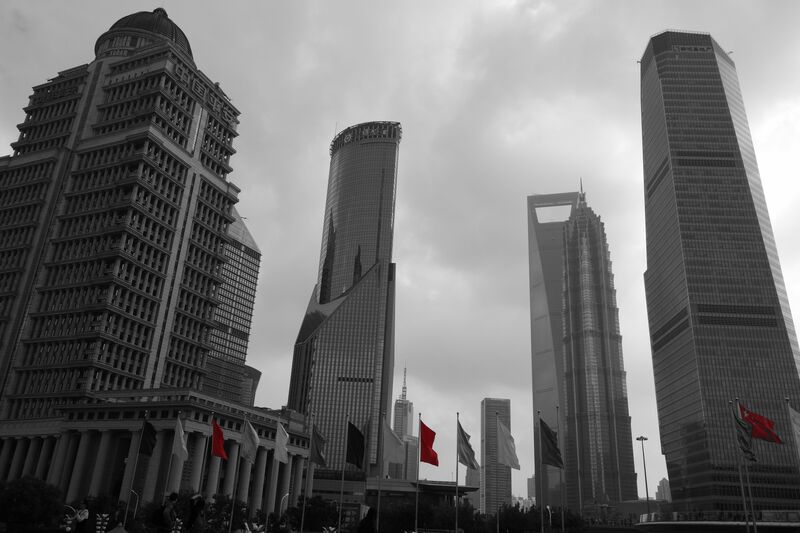 We’ve seen the Chinese government come to the party during the GFC and during the European debt crisis that followed, keeping China’s growth rate up over 7 per cent, rain hail or shine. No wonder traders and hedge fund gurus trust their guts on whether the dragon will roar again. But a well established patten hurts the most when it breaks. This time the problems in China seem to be inside China. They are not dips in demand caused by a failing USA or Europe. China recently experienced its first debt default and its first bank run. Corporate debt is being reined in. The big pile of flammable material at the heart of China’s economy is house prices that are too high. China’s property market issues are unique. Everyone agrees prices are in bubble territory and will have to fall. Even the Asia editor of the Economist, who is otherwise totally excited by more China growth. 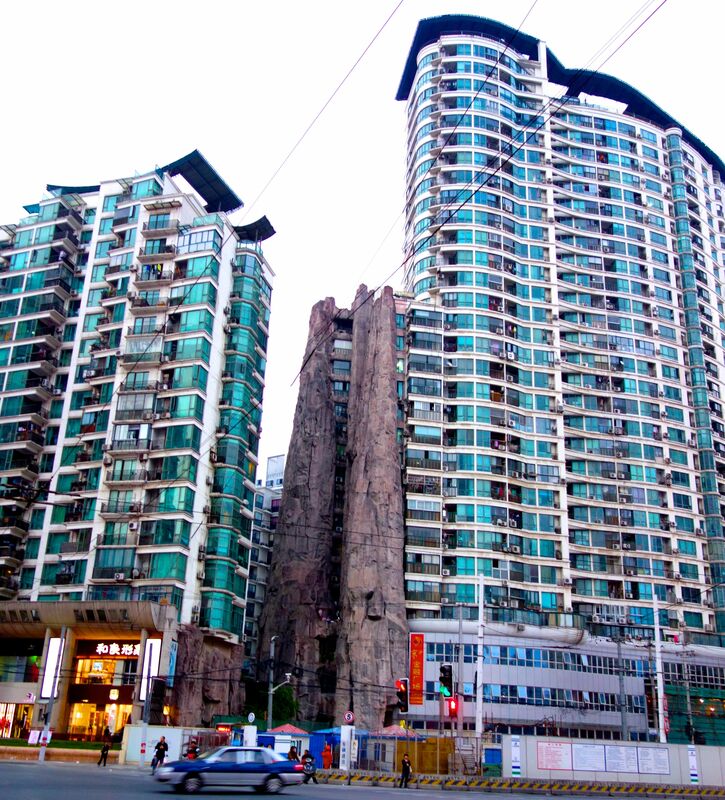 You can bet these weird Grotto apartments in Shanghai sell at a premium. 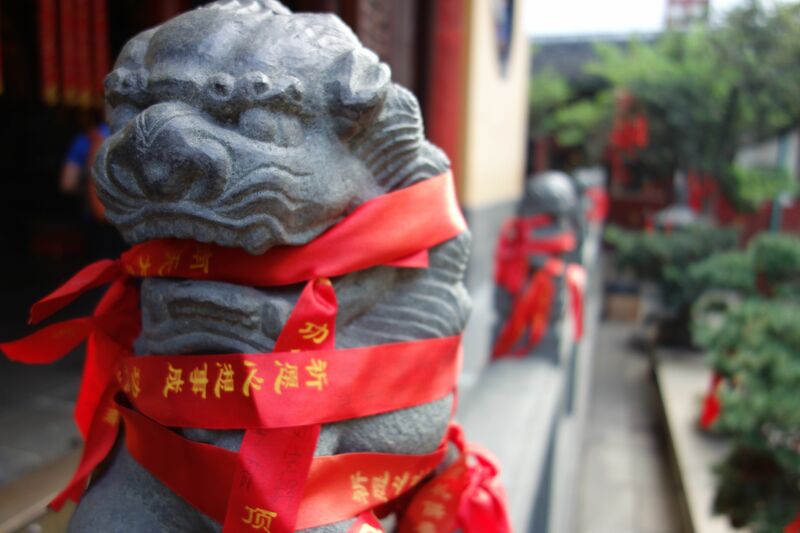 The question is what will happen when Chinese house prices fall. It’s easy to imagine that it will happen in a controlled way, or simply not be too important. That’s what Ben Bernanke imagined pre-GFC too. China is enormous and its government freer to act than most, due to the absence of democracy. I suspect any crash would be over sooner than some expect. But even a short dip would be a big problem. The value of China’s growth has been that it is consistent. It can be counted on. Having to risk-weight China’s future growth will take a lot of shine off Australian asset prices. House prices would be under attack from all quarters, with receding Chinese purchases, a falling share-market, and a weakening Australian economy. Bank shares, which account for a quarter of our stock market, tend to follow house prices. The Chinese government’s ability to manage its economy has become, it seems, one of the biggest risks to our wealth and well-being. It’s our head inside the lion’s mouth. Posted on March 31, 2014 Author thomasthethinkengineCategories UncategorizedTags Australia, China, china crash, growthLeave a comment on Betting on the Chinese Communist Party, and why that could make us poorer. 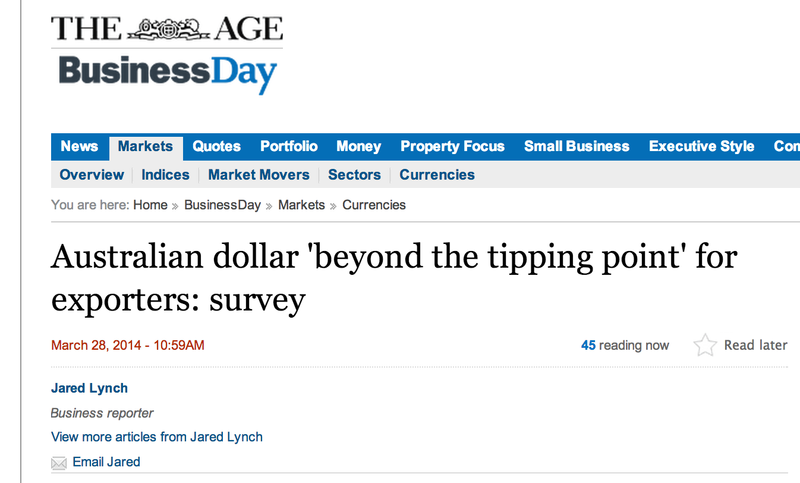 The Australian dollar has gone up! The only clear effect of that is that headline writers are in desperate need of a simple story to tell. 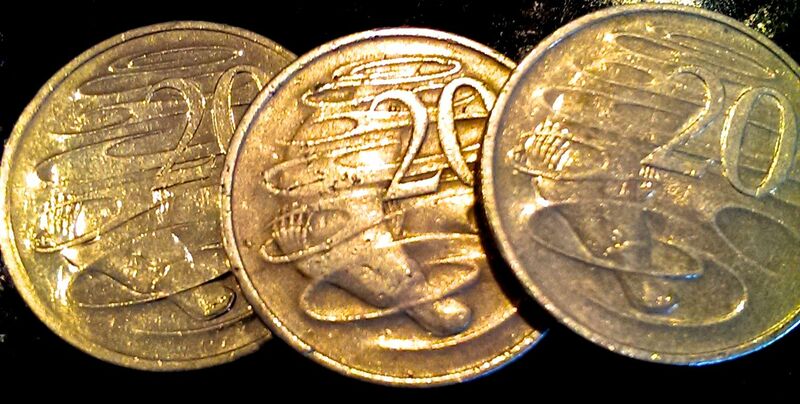 I wrote currencies for two years and there is always someone telling you that if only the dollar would fall below Parity / US90c / US80c / US70c, Australian industry will suddenly be in a bed of roses. Of course the young reporter will include such a statement in a story, because – finally – they have something to say about the currency that could garner a few clicks. But of course the reporter knows it is not true. There is no magic level for the dollar. Every little fall in our dollar increases the benefit of exporting. A certain firm may have a break-even level, but an industry will find its exporting grows easier gradually, not step-like, as the dollar falls. The effect on “industry” is in fact, even more complex than this. Firms don’t just sell. They have to pay employees and import material and equipment. That’s easier with a high dollar. The simple story is high dollar = bad. But with a really high dollar in the last few years, the Australian economy grew fast, and Australians enjoyed a high quality of life. We bought overseas holidays, flat-screen TVs, overseas apparel, smartphones and Apple Mac computers at an incredible rate. With a low dollar, such consumption is harder. But businesses should be better off. There will be less competition from imports, and it should be easier to export. But of course the equipment and materials they need to import as an input will rise in price. It’s almost as if every time the dollar moves, someone benefits and someone loses! The whole thing brings to mind, for me, Kurt Vonnegut’s famous graphing of stories. The industry wants you to believe that a rising dollar is a bad to worse story. The journalist writing the story is not going to fall for this – they want a better story arc than that. They position it somewhere along the arc of the first two graphs: Industry had it good for ages, now it is bad. Or, for ages industry had it bad, now it is looking good. But such arcs are only ever true for a sub-section of the economy. Overall, we seem to be able to thrive whether the dollar is low or high. Here’s the truth: Any move in the dollar is an ambiguous and mysterious development. It takes with one hand and gives with the other. If you’re worse off at work, you may be better off at home. If you lose your job making exports, you may get a job delivering imports, etc. Vonnegut, of course, turns nebulousness into celebrated works of literature. But currency writers are no Vonnegut. You can expect the inherent uncertainty that should be the backbone of currency stories to remained concealed. Why the public transport election promise is bad policy, but good news. A super bold plan has come out of the Victorian Government. They pledge to make public transport free in the city centre, and to abolish Zone 2, the higher-fare zone in the outer suburbs. It is a flashy announcement, like putting Protective Services Officers on every station, that reveals its proponents don’t really use public transport and want to believe something – anything! – other than really expensive infrastructure improvements are key determinants of service quality. This blog has advocated for free public transport in the past [Myki vs Free PT] but in this case the best I can say is that I don’t hate these ideas. Free public transport within the city. Upside: No need to deploy those rude and aggressive ticket police. Accept that the amount of crowding means the service is scarcely worth charging for anyway. Simpler for tourists. Downside: Amount of crowding is likely to increase as we enter a tragedy of the commons situation. Public transport policy is not tourism policy – using transport policy for other ends is partly why it is not up to scratch. Less revenue to improve the system. The end of Zone 2. Upside: Simplicity in the public transport system is good – people expend physical and mental energy trying to beat the Zone 2 boundary. The people who live in Zone 2 are most likely to need the discount, so there is an equity effect. Downside: We are not at a stage where we need to encourage patronage on the system – it’s busy enough as it is. Public transport policy is not social welfare – using it for non-transport policy ends is partly why it is not up to scratch. Less revenue to improve the system. Likely rising fares in Zone 1 over time to recoup lost revenue. Essentially, this is a policy with some benefits, but they do not strike at the heart of what our system needs – more services more often to more places. In fact, by reducing the amount of revenue – the Budget will estimate of how big a reduction – it may undermine that true goal. What this whole surprise announcement says to me is that the Government recognises Public Transport is its big weakness. And that recognition could make for a big turning point. This government sailed into power on the failure of Labor to do PT properly, and by promising better PT – to Doncaster, Rowville and the Airport. But it has made a giant road tunnel into its signature reform. Now it is scrabbling to catch up. The reality is that the Liberal party will probably lose the November election. They have a one-seat majority thanks to the support of corrupt independent Geoff Shaw. They have a premier we never voted for after the previous one was kicked out. They are a shambles. A poll taken in early March has the government behind 47-53. But ex-post, the big narrative to explain the election result will likely be public transport. After the 2010 election, the Frankston line was identified as a crucial issue that lost key seats for Labor. If public transport is once again seen as a swing factor in 2014, the narrative will be established in political operatives’ minds. 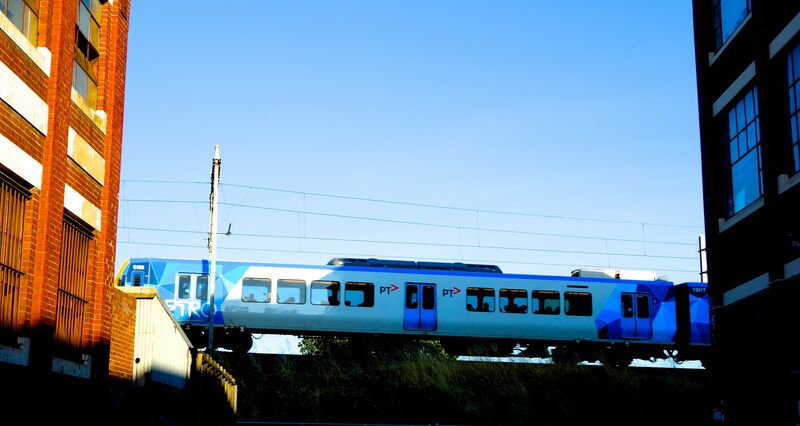 In Victorian elections, good public transport policy could come to be seen like a pledge not to increase GST, or a stern approach to boat people – an absolute must have for any party to succeed. Imagine if the top minister in the government was dedicated to the public transport portfolio. Imagine if that minister actually rode the trams and trains at times when the cameras were not directed at them. It’s just possible that a golden era of public transport policy is around the corner. Posted on March 27, 2014 Author thomasthethinkengineCategories UncategorizedTags public transport, transport, victorian politics1 Comment on Why the public transport election promise is bad policy, but good news. The Abbott government has announced it bringing back Knightoods and Damehoods to Australia. Each year, four people will arise with the title of Dame or Sir. Of course, the whole thing is a retrograde step taken by a man with, by George, a madness for kings. Knighthoods were first axed by Whitlam in 1975, reintroduced by Fraser in 1976 then axed again by Hawke in 1983. In one way, I like it. The old honours system which topped out with ACs and AOs was both sterile and opaque. The Sir and Dame system is one that people can grasp. From Sir Lancelot to Dame Judi Dench, people see and understand. If a comprehensible public honour is not the point of an honour system, I don’t know what is. But the real question for an economist is why would people value a knighthood. It doesn’t come with a free horse and castle. It doesn’t get you a discount at the shops. In some ways it’s less useful than a seniors card. While the income bump from winning an Oscar has been comprehensively studied, old-school conventional economics has little to say on the matter of awards for public service. Luckily our friends in the fields of behavioural economics have tuned their antennae more closely toward the workings of the human mind. At my old employer, Fairfax, the publication of the BRW rich list was an event that carried huge importance. As if the money was not reward enough, certain business people would contact BRW to make sure their assets were sufficiently valued that they would feature prominently in the list. Being on the list did not increase the value of their money in a consumption sense, but it strongly increased its positionality. In the case of Australia’s newest old-fashioned honour, just four will be handed out per year. Something so rare will indeed have cachet to spare. The honours are apparently designed for public service, so the tabloids obsession with a Sir Shane Warne may never materialise: “My intention is that this new award will go to those who have accepted public office rather than sought it and who can never, by virtue of that office, ever entirely return to private life,” Mr Abbott said. Such prizes may be efficient. In a world where tax dollars are not exactly overflowing from Treasury coffers, the government can use prizes as compensation for jobs that would otherwise command a lot of pay. Where you can pay someone with a reward that costs you nothing, it would be economically unwise not to do so. Phaleristics is the study of awards. There is a strong economic literature on the merits or using awards as motivation. From the merits of prizes in furthering science to prizes for poetry and independent film. Awards litter most fields. They are especially prominent in fields where the best make a lot more money than the rest, such as acting, and in fields where the government pays the players (the military). These may be fields where contracts are especially hard to specify ex-ante. Awards like sportsperson of the year carry less weight than Best Actor awards, because it is far easier to identify success in sport, so an award adds little marginal value. (Roger Federer does not always show up to accept the Swiss Sportsperson of the Year award.) Similarly in fields where a free market determines the pay of participants, such as the private practice of law and business, awards are less visible and carry less prestige. Managing to keep Australian knighthoods and damehoods to just four a year may prove very challenging. And if it can be done, might such an exemplary public adminstrator not be rewarded with the creation of a still higher honour? Time will tell. Thoughts on the economics of honours and awards? Further reading you’d like to suggest? Put your thoughts in the comments section below! Cash makes street crime. Does Bitcoin make e-crime? From the United States National Bureau of Economic Research, an excellent new paper. Richard Wright et al exploit a terrific natural experiment, wherein some counties of Missouri moved to paying benefits by debit card (Electronic Benefits Transfer or EBT) prior to others, leading to a decrease in circulating cash in those communities. Wright et al show that the cycle of crime is thereby reduced, with fewer subsequent crimes in retaliation. They posit that part of the significant decline in crime in the United States over the last fifty years is due to the decline in the use of cash. Cash is now used in only 50 per cent of transactions in the US, down from 80 per cent 50 years ago. It’s all about the Platypi, baby. The data is sound, the methodology makes sense and the conclusions are appealing. So what are the lessons? Like many of us, I am a fan of PayPass. I have a Mastercard I sling for every transaction I can these days, because PayPass means no need to bother my fingers with signing or PINs. It’s terrific. I use it for the piddliest little transactions, like a cup of coffee, and I go to the ATM perhaps once a month. But that electronic transaction is anonymous. Anyone who has my Mastercard could use it. I strongly doubt any vendor would attempt to match my name to the identity of the person using the card. That card is only good for transactions up to $100, but a swift criminal could probably rush up to the card limit before I managed to cancel it, especially if they took the card surreptitiously rather than by force. So I worry that the rise of PayPass and the Visa equivalent could reinstate some of the street crime that has been ebbing away. But an even bigger lesson is there to be learned, online. As recently as a year ago, there was no real cash on the internet. For online transactions you used credit cards or you provided proof of cash transfers made in the banking system. Both of these were intermediated by financial institutions who take the blame for fraud. Sure, you could steal a credit card number online, just as you could offline. But that was tightly policed and internet commerce was relatively safe. Now there are 12 million Bitcoins in circulation, worth $573 each. That’s $6.9 billion of cash. The hermetic and pure world of the internet, which was once all about cat videos and enthusiastic editing of Wikipedia articles has been sullied by cash and the crime wave that has followed. Is anyone surprised the news has been rife with stories about Bitcoin theft in the last few months? Flexcoin had $620,000 worth stolen. Poloniex lost 12.3 per cent of its coins. And of course the big one. Mt Gox lost 650,000 Bitcoins, worth several hundred million dollars. Crime does pay, and the way Bitcoins are designed to be anonymous means that it pays without great risk. Hacking will continue so long as Bitcoins are kept on the internet. It remains inconvenient for Bitcoins to be kept offline, if they are to be used as an actual currency. Even if they are only kept as investments, they still need to be brought to market for trade, and that offers up opportunities for hacking. The introduction of Bitcoins to the internet has transformed the internet into a place that traffics not just ideas and new shoes, but also drugs and murder. In other words, it is now just like the real world. At the moment, the online cash economy has a frontier element, with big audacious thefts, akin to the bushrangers of early Australia. That will die down. The way I perceive the hacking risk being diminished in future is if the big companies that have experience in protecting online transactions get involved. I can imagine having a Bitcoin account attached to my Commonwealth Bank account, and/or attached to my Mastercard. It would undo a lot of the supposed advantages of the electronic currency, such as anonymity, but introduce convenience and trust. “True” Bitcoiners will moan about the way the point of Bitcoin is lost, while everyone else just appreciates the fact that their currency is now secure and functional. I suspect people’s enthusiasm for perfect anonymity pales in comparison to their desire not to lose the money they put on the internet. Of course, Bitcoin transactions outside, say, the “CitiBank Bitcoin Protection Protocol” would still be available, just like the way I can pay for a car with a big wad of cash. But the people engaging in these transactions place themselves at greater risk. Who is most likely to trade anonymity for risk? The same kind of people who currently use cash. Might it be that Wright et al can write another paper in 20 years about Bitcoin and security that shows less Bitcoin being traded online correlates with less online criminal activity? Posted on March 25, 2014 Author thomasthethinkengineCategories UncategorizedTags bitcoin, cash, crime, security7 Comments on Cash makes street crime. Does Bitcoin make e-crime? I watched True Detective Season 1. Rarely do acting, writing and production values come together in such a package. It was gripping. Two detectives, played by Woody Harrelson and Matthew McConaughey, hunt down a serial killer in rural Louisiana, while the scenery drips with evil portent and minor characters utter veiled references to the Robert W. Chambers story the King In Yellow. When Woody and Matt encounter the bad guy in episode eight, the big revelation was not the identity of the creep in his catacomb. It was that this great run of TV was now done for good. Harrelson and McConaughey agreed to something odd – a one season run. There will be a second season of True Detective, but characters, locations, etc will all be different. The absence of more makes what we got so special. Economics has an explanation for this. Scarcity drives value. That’s why caviar costs $4000 a kilo even though it is not that nice to eat, but bread costs as little as $1 a loaf even though it is amazing. TV has for 50 years ignored this fact. TV networks have tried to wring every last drop out of anything good. There are many examples; 41 years of the Young and the Restless, 30 years of Neighbours, 17 years of South Park. That has been the measure of success in TV. Being renewed. To me, The Simpsons is the epitome of the idea. It’s a widely respected show. For 25 years, the family from Springfield have skateboarded, sucked, saxophoned, slacked and supported through an episode a week. The Simpsons has at times been a brilliant show. But once it turns into a permanent fixture, it becomes about as compelling as the wallpaper. The scarcity of film and audience’s awareness of its finite nature is no doubt part of what has given it cachet, driven the best actors into its arms, and allowed payouts that peak at almost $100 million per film. Despite the cachet of film, it is not without problems. Film is limited to three hours at most. That’s not enough to tell the kind of epic story humans love. TV can be the better medium and recent shows have proven that, with an arc of quality stretching from the Sopranos to House of Cards. Now actors that graced the silver screen are appearing on the small screen. From Rob Lowe and Martin Sheen in The West Wing, to Harrelson and McConaughey in True Detective. True Detective got those actors by promising a short run, but attracting top talent is not the only practical reason for a nice short run. When a network makes the decision to commission a second season, the writers must immediately start hoarding ideas, making the characters do new things, lifting the role of minor characters or introducing long-lost children/siblings/partners.They also write the second season with an eye to the third season. By then viewers are often attached enough to the characters to put up with it all, but it dilutes the quality of the show. Short runs permit writers to do story arcs that hit satisfying conclusions rather than just situational drama or comedy, or story arcs that linger on ridiculously. The success of season 1 of True Detective could go two ways. It could mean lots of shows opt for short sharp seasons, or it could mean HBO commissions 22-episodes for season two, with an option to renew. It should be no surprise by now that I would rather the former. 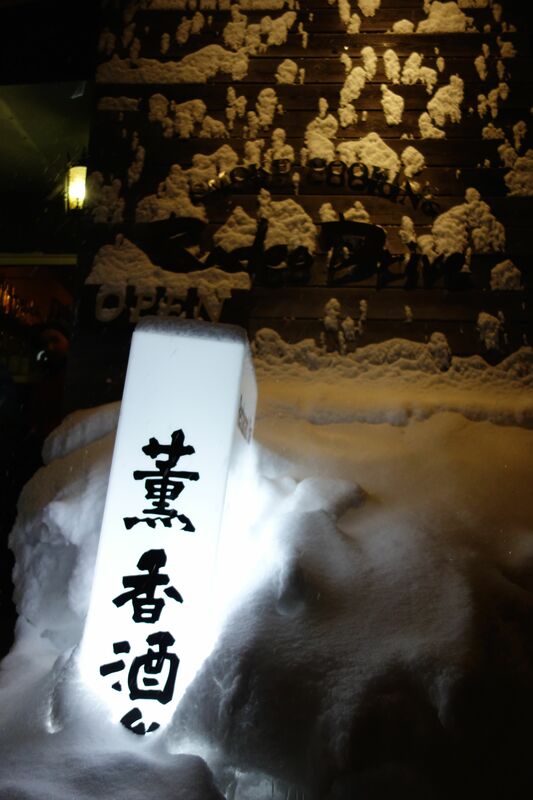 I am on holiday (in Japan) and will not be able to post daily for the rest of this week and or next week. Posted on March 13, 2014 Author thomasthethinkengineCategories UncategorizedLeave a comment on Absence!